Port Cocheres and driveways are a winning combination! Today, the use of port cochere’s can be found with many architectural styles, from Traditional to Arts and Crafts. Here is an example from one of our clients in Pebble Beach, CA. 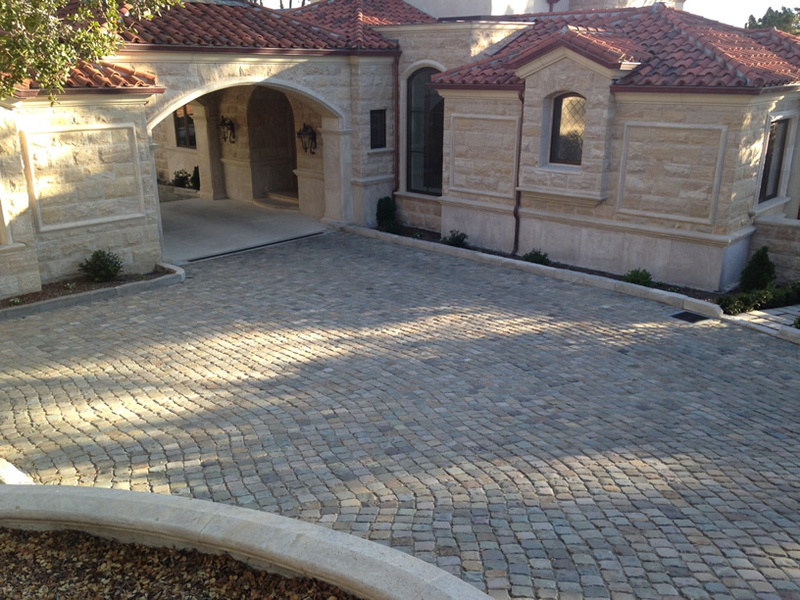 who selected Historic European Cobblestone in antique Sandstone 5″ x 5″ and small mosaics for their port cochere, driveway and motor court, accentuating the beautiful architectural style of the home. A port cochere (pronounced port co-share) is a French word for “coach door” and was originally an entrance or gateway to a building large enough to permit a coach (horse drawn carriage) to be driven through then into the interior courtyard beyond. These gateways are common features of large homes and palaces built during the reigns of Kings Louis XIV and XV of France.. Different than a car-port, where vehicles can park, the port cochere evolved as an architectural element used to protect occupants in carriages or vehicles as they were dropped off at entryways. As a porch roof built over a driveway, the roof needs to be large enough to accommodate a wheeled vehicle, since its purpose was to provide shelter from the weather for those getting in or out of the vehicle. The driveways leading up to port cocheres historically were constructed with dirt or gravel. However, the combination with handsome driveways are both common and desirable with today’s architectural styles including the use of cobblestone, brick and other attractive surfaces. Visit our gallery page for more images of beautiful projects we’ve supplied authentic reclaimed cobblestone for port cocheres, driveways, motor courts and more. Then give us a call to discuss your design – we’re happy to assist in the design and stone selection process.